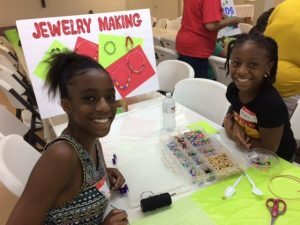 The Arts Council of Pointe Coupee is pleased with the second round of Art on the Go camps which visited the Innis Library on Tuesday, July 10 and St. Augustine Catholic Church on Thursday, July 12. Twenty children participated in the camp at Innis and fifty-nine at St. Augustine. Gale Roy, Executive Director for the Arts Council, and Elaine Ladmirault, program coordinator, were thrilled with the participation and enthusiasm of all the children who were part of this summer’s Art on the Go programs. A total of 112 children participated in the four sites and thirty adult volunteers assisted. Six visual arts activities, face painting and dance were provided for the campers. Most activities were the same as those offered in June for the Mayor’s camp at the New Roads Information Center and St. Ann’s camp in Morganza. At Innis the children enjoyed string art and at St. Augustine they did sand paintings. Organizers will review feedback gathered from participants and volunteers in planning for next year’s summer offerings. A special thanks to Elaine Ladmirault for her selection of engaging activities and her attention to detail. The Arts Council is appreciative of all the activity facilitators and other volunteers who helped children complete their projects and kept them actively engaged. Support for the Art on the Go camps comes in part from a grant from the Episcopal Community Services / Gaudet Fund. For information about becoming a member of the Arts Council of Pointe Coupee or a volunteer, contact Gale Roy at roygaleb@bellsouth.net or call 225 718-1574.